I found myself in Harvard Square today, and on a whim I dropped into local comic book shop The Million Year Picnic. The store sometimes has older, out-of-print books I happen to be looking for. Instead I saw something I’ve had on my wishlist for some time but never committed to: Shimura Takako’s Wandering Son. I’ve admired Fantagraphics’ beautiful hardcover printings of Wandering Son for a while now but never committed to buying a copy—today the mood took me. I think it’s because lately I’ve seen an increasing amount of manga artist Shimura Takako’s work via her beautiful Tumblr and through popularity of current-running anime Aldnoah.Zero, which she did character designs for (she has lots of “fan” art of the show on her Tumblr as well). Wandering Son follows the story of two transgender youth and them coming to terms with Japanese society’s expectations while growing up. This series has been recommended to me by a couple of my trans friends and the back cover copy states, “written and illustrated by Shimura Takako, acclaimed for her sensitive take on LGBT topics,” so I’m pretty excited to continue reading. It’s rare to find works dealing with such topics that don’t devolve into tropes. 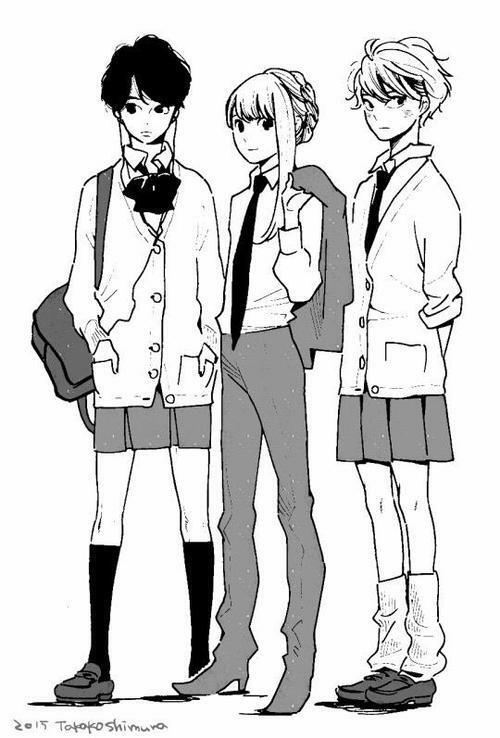 Wandering Son also happens to have an anime adaptation, which you can stream from Crunchyroll. I had been told for a while now by many artist friends that I needed to read Naoki Urasawa’s Monster. And I now know that I wasn’t being lied to. Unfortunately the series had been painfully out of print for a long while. At local comic book stores I’d find random copies of volume 8s and volume 12s but never a coveted volume 1. And Urasawa has seemed rather averse to digital reproduction, so starting up Monster was out of reach for all but persistent fans. But VIZ Media just this week released the first volume of a Signature Edition run of Monster, featuring a 2-in-1 printing with larger than normal paper size and some color pages. This might have wisely been in anticipation of the potential Guillermo Del Toro co-written HBO pilot of Monster that was mentioned last year. But no matter how it came about I’m just glad it exists and I can finally see what everyone was talking about. And it is really, really good. My only exposure to Urasawa prior to this had been reading through the entirety of Pluto, his officially sanctioned gritty re-telling of Osamu Tezuka’s Astroboy. I don’t have much background with nor nostalgic memories of the original Astroboy but Pluto left a big impact on me. I loved Urasawa’s diverse-looking worldly characters and how he peeled away interesting mysteries through his meticulous storytelling. And those same skills are spotlighted in Pluto’s predecessor, Monster. Even when you know what ultimate twist is coming, simply from reading any synopsis, the presentation is still exciting and surprising. And Urasawa is a master of drawing subtle facial expressions, which contrast well with his simply designed and well-paced panel layouts. Everyone was right, I can’t recommend this manga enough. I’m really eager for volume 2.